In 1939 the Squadron went for summer camp to Duxford in Cambridgeshire never to return to Speke as it was to called up for war duty. 611 excelled in cover of the UK whilst France fell to the Nazis, patrolled high above the Dunkirk beaches during the evacuation, played an active part in the Battle of Britain, took a very active part in the ill -fated Dieppe raid, covered the Normandy landings, escorted bomber intrusions over occupied France and later, with Mustangs, was able to provide long range bomber cover for both RAF and USAAF raids deep into Europe. Each phase of WWII is described in detail with extracts from Pilot’s Combat Reports, some direct graphic descriptions from the pilots themselves and excellent photographic coverage. Disbanded in 1945, the Squadron re-emerged in Lancashire (at Woodvale) in 1946 to provide fighter cover for the North of England and be available anywhere required. Initially manned by volunteers from the Liverpool area the Squadron was proud to be home to many aircrew from the Empire and other countries whilst retaining Auxiliary members, both air and ground crews, for most of the war. Reformed with one of its original pre-war Pilots as CO, the squadron again drew all its members from Merseyside area post-war both at Woodvale and later, Hooton Park on the Wirral. 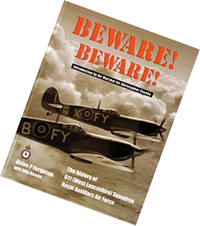 The narrative is supported by over 200 photographs and numerous appendices detailing every aircraft that served with 611, CO ‘s, bases, Roll of Honour, combat claims, time charts, map of base locations and more. This is a complete comprehensive history of a fighting Squadron and it’s men, both air and ground crews who put their lives at risk to stop the Nazi threat, many paying the ultimate sacrifice.